The U.S. Marine Corps is known as one of the most formidable military forces in the world, and its reputation is well-earned. From its famously rigorous boot camp to the fearless attitude of its troops, the Marine Corps is an appealing career for those who want to make a difference. It's important to examine all the Corps has to offer before deciding to enlist and to be aware that a tour of duty in the Marines is definitely not for everyone. It doesn't matter what your Marine Corps job is: If you're a Marine, you're going to deploy, sooner or later. The Marines are proud of the fact that they're all considered riflemen first, and whatever their military occupational specialty (MOS) or job is second. Officially established in 1775 by the Continental Congress, the Marines were created to act as a landing force for the U.S. Navy. They were established as a separate branch of the U.S. military in 1798. Marines specialize in amphibious operations, and are Marine Corps units are often attached to ships deployed at sea. Navy aircraft carriers typically deploy with a Marine flying squadron alongside Navy squadrons. 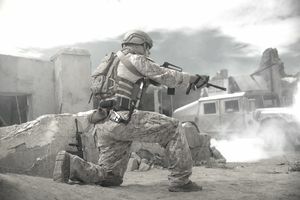 In the modern era, the Marines expanded ground-combat operations. In general, they're a more nimble, lighter force in comparison to other branches, with the goal of being able to deploy quickly. The branches of the U.S. military share many similarities, but each has its own unique culture. And each branch has different incentives, opportunities for assignments and jobs, deployment rates, and promotion rates. Here are a few of the factors in the Marine Corps you may want to consider before deciding to enlist. With the exception of the Coast Guard, the Marine Corps is the smallest military service and only needs to enlist about 38,000 new recruits per year (compared with the Army's average 80,000 yearly recruiting goal). The Marines are small because the Corps needs to be nimble in order to rapidly deploy. Marine Corps boot camp is legendary for being the most difficult and grueling basic training of all the branches of the U.S. military; at 13 weeks, it is the longest. There are two places where male Marine recruits train: Parris Island, South Carolina and the recruit training depot at San Diego, California. And as one might imagine, given the competitive nature of the military, there's an intense rivalry between the "east coast" and "west coast" Marines. Female Marine recruits train at Parris Island separate from the men. Everyone who enlists in any branch of the U.S. military is eligible for G.I. Bill, which provides tuition and living allowance stipends for American veterans. The Marine Corps also has a college fund which adds money to monthly G.I. Bill entitlements. The Marine Corps has more than 180 enlisted jobs, which as mentioned above, are referred to by their MOS number. Because the Marine Corps gets much of its non-combat support from the Navy, the job ratio is heavily weighted toward combat jobs. There's no real way to get a guaranteed job when enlisting in the Marines. The general expectation is that new recruits simply want to be a Marine, and then whatever job they pursue is a secondary concern. What Does It Take to Become a Mortarman in the Marine Corps?